My name is Payton Chung, I live in Southwest Waterfront in Ward 6, and I am testifying with regard to the Clean Energy DC Omnibus Amendment Act of 2018. I am also a board member of the District of Columbia chapter of the Sierra Club, which has heartily applauded this bill, and an editor for Greater Greater Washington. I’m a homeowner in a vulnerable location, just a few meters above the rising tides in the Anacostia and Potomac rivers. Some of my neighbors live in houses that are over 200 years old, which have made it this far, but whose survival in coming decades depends upon the passage of this bill and others like it. The past few years of weird weather have given us a small taste of what a destabilized climate means for DC. So-called “business as usual” carbon emissions are a misnomer, as they will ensure that business will soon become very un-usual. Instead, businesses need the certainty of knowing that emissions will decline, and therefore that their business can indeed proceed as usual. Passage of this bill will also cement DC’s position as a leader in green business development. We are the nation’s undisputed champion in the green and energy-efficient building sector, with more buildings certified under the Leadership in Energy and Environmental Design (LEED) or Energy Star rating systems per capita than any other U.S. city. Green building professionals like myself (a LEED accredited professional in neighborhood development) have risen to the challenge set by DC’s high standards for building energy efficiency, and are capable of helping DC achieve the even more rigorous standards included in this bill. By expanding the SETF and Green Bank, this bill also ensures that all Washingtonians can implement these advanced technologies. Passage of this bill will also boost expand DC’s already substantial “green dividend” – the economic gains we see from the fact that DC residents spend relatively little on fossil fuel imports, and therefore spend more with DC businesses. Since DC does not produce oil or gas, every dollar spent on these fuels vanishes from our local economy in a puff of smoke. Increasing energy efficiency for our buildings and transportation network directly lowers operating costs, saving businesses and residents money and keeping dollars within DC. Thank you for the opportunity to testify in favor of the Clean Energy DC Omnibus Amendment Act. Which cities did I expect to enjoy visiting, and which ones did I enjoy in reality? Here’s a 111%, completely, utterly, totally subjective look at 57 cities in North America, reduced to a scatterplot. Since the data labels might overlap, a link to the full spreadsheet is here. Yes, Cleveland (4,2) tied San Francisco (9,7). As always, YMMV. Based on visits mostly within the past decade. 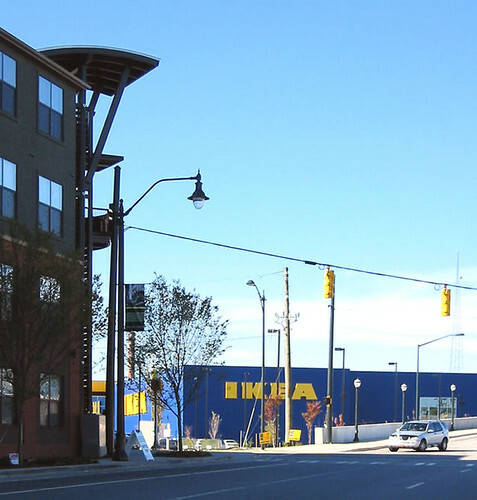 Coming soon to a power center near you: Ikea? Ikea is in the midst of a complete rethink of their US store strategy, rapidly announcing the cancellation of multiple superstores that were due to open in 2020: in my hometown of Cary, N.C., outside Nashville, west of Phoenix, and Fort Worth. Other stores set to open in 2020 could also be canceled, affecting plans in northwest Denver, the East Bay, and northwest of Atlanta. Stores already under construction, like one in Norfolk, are proceeding as planned. As Ikea branched out from America’s top-20 metro areas (median population ~5 million) to the top-40 metro areas (reaching some with populations below 1.5 million), it doubled its store footprint — but now each new-build store addressed fewer than half as many potential customers. Some of the mid-sized cities draw from large hinterlands and can easily support full-sized stores, like Salt Lake City or Jacksonville… but many blur into Ikea-served regions nearby: Hartford, Providence, Tulsa, Richmond, Raleigh, or Buffalo and Rochester (near Toronto). Even within the megacities, customers on the far side of town, or downtown, don’t want to carve out an entire day to drive all the way across town to wait in long lines and stress-eat meatballs. Much has been written, albeit with few details, about Ikea opening shops in city centers. A look at their small shops in the UK and Canada indicate that they’re primarily using these new compact store formats to reach smaller metro areas, not necessarily “alpha” global cities, and to fit into strip malls where people are already shopping. Canada’s six “IKEA Pick-up and order points” are up to twice as large — about the size of a small supermarket, from a Fresh Market on the small end (20,000 sq ft) to a Whole Foods Market on the large end (40,000 sq ft). They are all located in suburban locations, outside smaller cities in Ontario and Quebec. Around Toronto, for instance, are a series of smaller satellite cities — close enough that people could drive to the city for Ikea, but in practice rarely do. The biggest city, Hamilton, has a full Ikea, but what do with the smaller ones? Now that the PUP exists, every city can have a conveniently sited Ikea. For instance, Ontario’s Tri-Cities, a collection of college towns (Kitchener, Cambridge, Waterloo) about 60 miles outside Toronto, with a regional population of about 500,000. There, IKEA located in a Costco-anchored strip mall in the center of the region — well away from the area’s universities. All of the six PUPs are adjacent to either Costco, Home Depot, or the like; five are in power centers, and one in an enclosed mall (although untraditionally anchored by Walmart). The “Pick-up and order points” (PUPs) address many of the potential customer segments that its previous superstore strategy missed. Since they’re 90% smaller than full-sized stores, they can easily branch out into smaller metro areas, or fill in around megacities. As a bonus, they can go into existing spaces, for faster and cheaper build-outs, and can go into first-tier locations rather than being shunted to second-tier sites which happen to have room. Several have even backfilled existing dark big boxes — e.g., Birmingham was a Toys ‘R’ Us. Two of the cancelled locations, in Cary and Nashville, were being planned as part of turnaround plans for dying malls. Those locations contrast sharply with the first wave of Ikea USA locations, which were often right outside fortress malls. Future PUPs will likely be in well-trafficked power centers, close to fortress malls, and are a terrific opportunity for landlords like Kimco or DDR. Comment submitted to HPO, regarding its Preservation Plan. I am a homeowner, in a historic landmark building. I have been a National Trust member for my entire adult life, and have spent almost all of that time living in National Register-listed buildings. I consider myself an ardent preservationist. It therefore pains me to say that the historic preservation process in DC is broken — as I have recently documented in Greater Greater Washington. The District has designated almost as many historic structures as New York City, which has 6.4 times as many total structures. 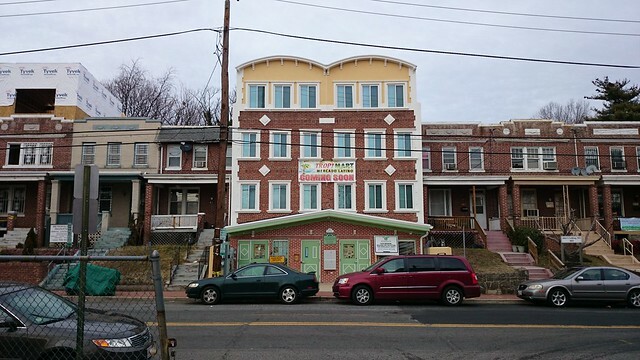 Thousands of unremarkable buildings such as production-built rowhouses and strip mall parking lots, almost identical to thousands or even millions of others around the country, have been deemed by HPO and HPRB to be “locally significant” for seemingly no other reason than the fact that they exist. I became a preservationist because I am pro-urbanism, and want to maintain the rich urban fabric of small-scale buildings, evolved over generations, that was common in pre-WW2 America. It is dispiriting to see that NIMBYs have hijacked the historic preservation process to stop that very process of urban evolution that created the places they claim to admire. Instead of pouring all of its resources into finding more and more mediocre buildings to designate as “locally significant historic resources,” HPO should instead halt the process of reviewing outside nominations and focus its efforts on a comprehensive, District-wide survey of structures to identify those of high historic and aesthetic merit. Los Angeles has eight times the land area of DC and six times as many buildings, and completed a full survey of its structures within eight years. Meanwhile, DC HPO is now 40 years old, and has not completed a District-wide survey — ignoring many potential treasures in overlooked neighborhoods, while lavishing time and attention to ensure that no detail is overlooked for every single building in the District’s prosperous quarters. Historic preservation also should not triumph over other aspects of the Office of Planning’s remit. The District has other planning priorities besides preservation, including creating affordable housing, allowing more people to live and work near transit and the regional core, and increasing renewable energy production. HPO and the HPRB must find ways to balance their own mandates with others’. Not too surprisingly, eight of the top 10 from that particular ranking ended up as finalists for Amazon’s HQ2. The other two are Seattle (HQ1) and the Bay Area, which is currently Amazon’s second largest location. Top 10 (minus SF) circled in blue; cities officially ruled out for talent reasons in red; shortlist cities with even smaller talent pools ruled out in blue. Source: BLS, via CBRE. Now that we know that Detroit and Baltimore don’t have enough local software engineers, who does? 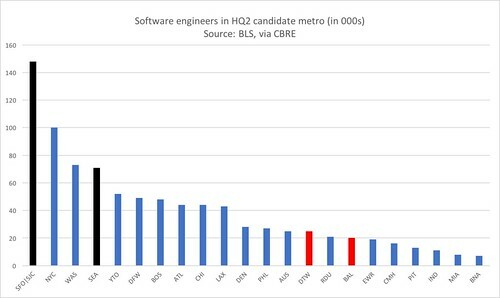 Helpfully, CBRE also looked specifically at the software engineer labor pool. HQ2 candidates are in blue, Seattle and the Bay Area are in black, Detroit and Baltimore are shown in red. Click to enlarge. There’s a substantial gulf between the top 10 and the latter 10, with Los Angeles having about 50% more local programmers than Denver. More importantly, if Detroit was rejected because they don’t have enough programmers, how can Philadelphia or Raleigh say otherwise? This puts the smaller labor markets on the shortlist at a steep disadvantage. Only Newark can make a case that it could pull commuters across the Hudson (though not for long). Shallow talent pools also explain why “turnaround” sentiment wasn’t enough to save bids from Rust Belt cities. The only Midwestern cities that made the cut are either Sunbelt-era cities that happen to be north of the Ohio, like Columbus and Indianapolis, or the classic turnaround success stories of Chicago and Pittsburgh (even if both have deeper post-industrial legacies than the coastal cities). A bit less confidently, recent large office leases in Boston and Manhattan are probably best thought of as consolation prizes, given that the locations chosen don’t have much in the way of expansion options. Leases being negotiated now would reflect planning work that was underway before the HQ2 search got going. [Update, 1 May: not alone on this reasoning.] Recent warehouse and data center leases or openings, of course, have zero bearing on future office locations. 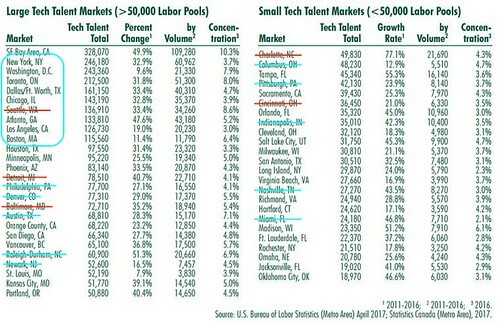 The Boston move also has implications for cities 5-10 in the above chart, all of which have ~45,000 programmers. Quality of local talent is also important, and proximity to MIT gives Boston an edge over others in this group. If Boston and NYC are only worthy of consolation prizes, who’s left? Hint: it’s also the metro where not just the number of programmers most closely matches that of Seattle’s, but their skill sets do, too. Paddy Power betting odds, which explicitly exclude the Americans who might know anything about the cities. I don’t see British newspapers breathlessly tracking every movement in how Vegas bookies view the English Premier League. Hiring a lobbyist in Georgia. They have lobbyists in other states (e.g., two listed in Virginia, five in Kentucky, three in Tennessee). Amazon really does seem to prefer working with single developers. Just one developer (COPT) has a four million square foot portfolio of Amazon data centers in NoVA. The already-tight timing is now getting a little ridiculous. The decision will be announced sometime in 2018, presumably not in the next few months — but occupancy is still supposed to be in 2019? That essentially limits the search to existing buildings. 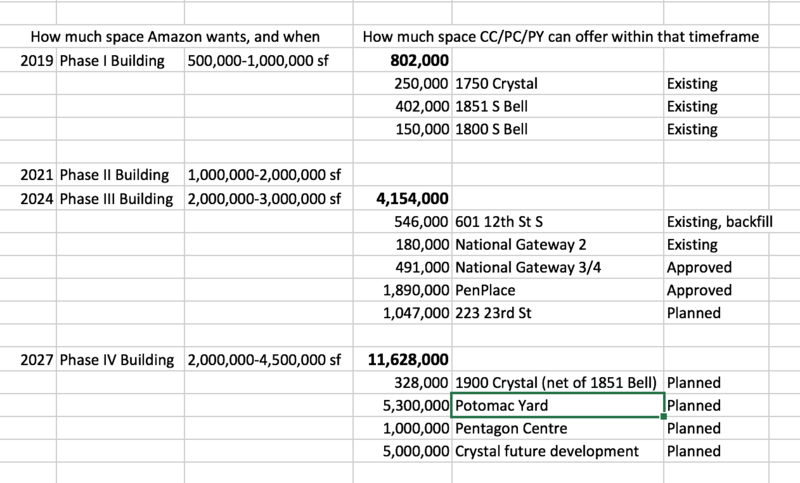 Update, 15 Sep 2018: Someone suddenly seems interested in Crystal City offices. As recently as January, JBGS filed plans to switch 670,000 sq ft of office capacity to 665 apartments. As recently as August, the CEO’s quarterly letter to shareholders promised a company-wide pivot from office to residential. Yet… In July, they retracted 1750 Crystal’s conversion, puzzlingly adding back 250,000 sq ft of office to a block with 551,000 sq ft empty. The result fits in neatly with a short, medium, and long-term occupancy strategy for HQ2.